Professional-quality manikins at a fraction of the cost! Built-in feedback features, including and tilting head and visible chest rise, help rescuer know when key skills are correctly performed. Comprehensive design allows for practice of Heimlich maneuver and abdominal thrusts, as well as CPR and mouth-to-mouth breathing. Realistic anatomical markings make it easy to learn correct hand placement for checking pulse, performing chest compressions, and more. Ideal for group training - allows each student to have their own manikin for maximum practice time. 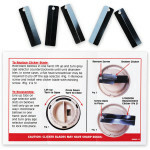 Easy-to-clean heads are dishwasher safe and can easily be sanitized. Hygienic, one-piece face shield/lung bags eliminate the risk of cross-contamination and minimize the need to clean manikins. 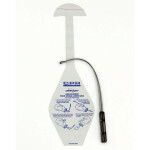 Designed to meet American Heart Association criteria for desirable manikin features. Each set is packed in a rugged nylon carrying case with a supply of 50 face-shield lung bags and an insertion tool. 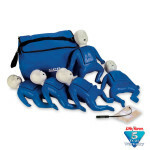 The CPR Prompt™ 5-Pack Adult/Child Training Mannequin - Blue.